Since 1995, The PEA has executed many projects in the fields of housing, health, education, tourism, industry, etc. The Gaza Strip is presently connected to the Israeli grid by eleven feeder lines, which are being operated in a radial mode at 22kV by the Israeli Electricity Corporation (IEC). 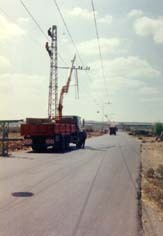 These feeder lines come out from 161/22kV substations on the Israeli side. Out of these feeders, two are being exclusively used for power supply to the Israeli settlements within the Gaza Strip. The remaining nine feeders are supplying the Palestinian areas and are all heavily loaded. The project is designed mainly to lay down the electrical distribution system, switchyards, and the automatic control dispatch for the GIS. The project is divided into three phases with a maximum demand of 22kV at full development. The estimated total cost of the project is 6.5 MUSD and covered by the World Bank through a loan to the ministry of Industry. PEA is expected to commission the first part of Phase I within January 1999. The project aims to supply more than 400 consumers at the coastal area of Rafah and Khanyounis via small diesel units. The first phase of the project connected about 100 consumers and utilized 300 kVA diesel units. The cost of the first phase reached 350,000 USD. PEA has contributed with the distribution networks, material and workforce. The PEA prepared studies and plans to improve the electrical sector. Therefore, the PEA established a department for rural electrification to complete and integrate the national plans. The main goal of this department is to improve the living conditions for the people living in the rural areas by connecting these areas to the main grid and thus enabling a stable and affordable electricity supply rather than the unreliable and expensive local generators. The PEA submitted these plans to the donor countries especially Belgium and Czeck. In 1997, the Belgium government and the Palestinian National Authority represented by PEA signed an agreement in which Belgium was commited to donate 7MUSD. The project is to connect about 29 villages in the northern region of the West bank. New lines of 33kV, metering rooms, low voltage network, and distribution transformers will be installed. The duration of this project is about three years which will be implemented in five phases. The project will be serving a total population of 42,531 inhabitants. Tobas project is the electrification of 19 villages on four stages costing 4.5 MUSD funded by the Czeck government. The first stage out of four is completed. The project is to serve 50, 561 inhabitants. Projects under planning include Nablus villages electrification of 30 villages costing 8 MUSD funded by the Belgium government. Also, Kafriat project is under planning and financed by the French government. Additionally, the Italian government, the European investment bank and the World Bank is funding other rehabilitation projects in the mid and south north Governorates. The project is focused on low voltage networks. The PEA designed and prepared the tender documents and supervised about 50km of LV network. The total served population is 9365 inhabitants. The UNDP financed the project to connect about six villages near Yatta municipality with the electrical network. The total cost is about 360,624 USD. These two towns are located in the southern part of the West bank. There are 15000 inhabitants and 1700 consumers in these towns. The project will provide the people by a permanent electric source to be used for water pumping and stones industry. The project is in its final stages of execution. The total cost of the project is about 466,000 USD. The PEA contributed to 40% while the Hebron municipality share was 60%. This village was connected to the electricity grid by 33kV overhead line with a length of about 1.2km. 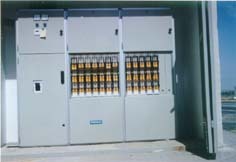 Two transformers with a toatl capacity of 1.26MVA have been installed. The project serves about 3500 inhabitants. The PEA signed a contract with the Norwegian government to finance Bethlehem 2000 project to prepare for the ceremonies of the year 2000 and to meet the growing demand on electricity as a result of the increasing population and the productive projects. The Norwegian government will contribute with 60% of the project and the PEA and the Jerusalem Electricity Distribution Corporation will have a contribution of 40%. · Stepping the voltage up from 6.6 kV to 11 kV. · The rehabilitation of the main distribution substations in Beit Sahor. The total capacity to be installed will be approximately 30 MVA. The 33 kV cable network will reach 4 km and the 11 kV cable network will be 13 km, while the OHL high voltage net will reach 25 km. The low voltage net will consist of cables at 8 km and ABC cables at 25 km. In addition, many poles and towers will be erected. The rehabilitation projects funded by the Norwegian government costed 23 MUSD. § Upgrading the existing electrical network. § Constructing new electric networks in addition to the old grid. § Minimizing the network technical losses and the fines resulting from lower power factor values. § Building new distribution transformer substations to serve metropolitan areas. § OHL medium voltage networks (33,22,11 kV) at a length of about 90-km. 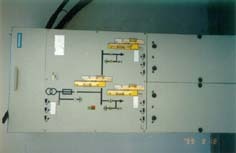 § UGC medium voltage networks at a length of 50 km. § ABC OHL low voltage network (400V) at a length of 120 km. 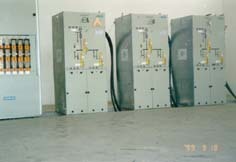 § Transformer substations (62.1 MVA) and power factor correction units (1.8 MVAr). It is anticipated that these projects are to be completed by the end of 1999. ¨ Supporting efficiency improvement and loss reduction in the distribution of electric power. ¨ Facilitating adoption and implementation of energy conservation measures in residential commercial and industrial sectors through education promotion financing and standard-setting activities. ¨ Assisting in the international and regional transfer of experience and technology that could be instrumental in the GHG emission reduction. ¨ Promoting public and private sector investments in energy projects that are beneficial for the global environment. The aim of this project is to help PEA to prepare a strategic action plan for energy sector through he suggested legislation and by studying the possibility of using Renewable Energy Resources (RES) in addition to data collection. The duration of the project will be 12 months. The budget amounts to 150,000 ECU. The goal of this project is to build a system and a net of information in order to support the planning of energy sector in Palestine. The duration of the Project is 14 months beginning October 1998 and the budget totals 150,000 ECU. The project lasting for 12 months has evolved with establishing a solar water heater-testing laboratory. The Palestinian energy scientific center was also founded. The project was funded by the PEA and the EC. 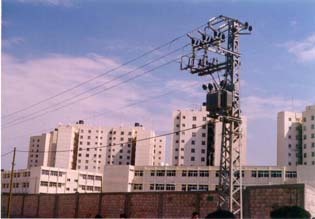 In Mid December 1998, a solar energy unit was installed in Arab Al-Kaabneh village; 20 km to the south of Hebron. 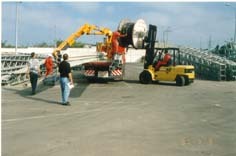 This unit was donated to PEA by green star foundation with the assistance of the US department of energy. The suntainer has a maximum power of 4kW and can generate up to 20 kWh of AC electricity per day. The suntainer include a solar powered ultraviolet water purifier, a vaccine cooler and a digital cellular antenna for access to data networks. The total cost of the project was 150,000 USD. An agreement was signed between the PEA and the Palestinian Specifications Institution to establish a lab to test the flat plate solar collectors locally manufactured in the Gaza Governorates in order to meet the international criteria for such industry. Another lab is to be established in the North Governorates. The project is under execution where the lab will be situated in the PEA Head Quarters and will be ready soon to receive the solar collectors for validity approval. -The PPA governes the sale of power to PEA and defines the Concessions period and all legal and financial obligations. - Both PEC and Enron have finalized this agreement with PNA- and PEA on 18th of June 1999, in the presence of president Arfat. -Believing that, through the cooperative efforts of the PEA, PEC- Enron international, and ABB that a technically advanced power plant will be successfully constructed to meet the needs and demands of the Palestinian people. Geographic location close to the sea . Proximity to Egypt for future gas . 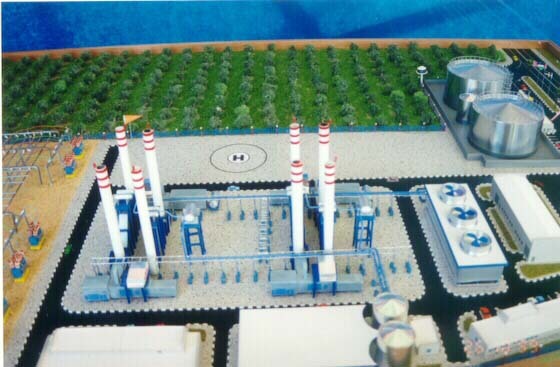 140 mw combined cycle power plant fueled with fuel oil Initially, and convertible to natural gas when available. Four (4) 23 mw combustion turbines. Energy in the combustion turbine exhaust. Energy captured in the boilers. One (1) seawater-cooling tower to reject the steam turbines waste heat to the atmosphere. One (1) 10,000 cubic meter fuel oil storage tanks with four 4- fuel oil storage tanks with four 4 truck-unloading stations. In Mid December 1998, a solar energy unit was installed in Arab Al-Kaabneh village, 20 km to the south of Hebron. This unit was donated to PEA by green star foundation with the assistance of the US department of energy .The suntainer has a maximum power of 4KW and can generate up to 20Kwh of AC electricity cooler and a digital cellular antenna for access to data networks. The total cost of the project was 150.000 USD. In general, the Gaza strip is characterizes by a very low wind speed throughout the year, During the summer the wind speed mostly is between 1.0 to 4.0 m/s in August. Shown here are Arab Al-kaabneh students with the school principal and President of the Village Council, Mr. Audi Nasir Al-Najada.He said the solar power system represents a big step that will open vast new horizons for not only the children but the entire village community. However in winter, December, the wind speed can go as 8.0 m/s throughout significant period during the month. The West Bank has more potential and average wind speed reach up to 9.0 m/s in winter, in some areas like Ramalla (Small City near Jerusalem). Table below presents, for selected location in Palestine, roughness class and wind potential in Kwh/m2 at 10,20 and 40 meters above ground level. The PEA signed agreement with the UNDP to implement the project. Its duration is 3 years. The project is financed by the Global Environmental Facilities (GEF). - Supporting efficiency improvement and loss reduction in the distribution of electric power. - Facilitating adoption and implementation of energy conservation measures in residential commercial and industrial sectors through education promotion financing and standard-setting activities. - Assisting in the international and regional transfer of experience and technology that could be instrumental in the GHG emission reduction. - Promoting public and private sector investments in energy projects that are beneficial for the global environment. PEA has recently established two new departments energy, nuclear energy and radiation protection diroctrate (NERP) . The enegy department is responsaible for overall planning, regulation, and control. Mean while the NERP responible for policy making, legislation, promoting the peaceful application of ionizing radiation and responsable also for establishing a palestinian radiation protection and safty program. A strategic energy action for Palestine. Studying rational use of energy in the building of Al-Bireh municipality. Studying of rational use of energy in Gaza Strip for domestic sector. Performing a comprehensive scan through the ionizing source and practices in palestine were identified analyzed. A five years action plan for NERP was prepared. Organizing training sessions and workshops pertaining radiation protection and radio action waste management. Establishing Palestinian radiation protection program and analyzing the natural background of radioactivity in Palestine. The technical teams of the PEA and the municipalities rehabilitated 70% of the network. These projects were financed by the Norwegian grant with a total cost of 23MUSD. The rehabilitation projects funded by the Norwegian government with total amount of 23 MUSD. The objectives of the project focus on the following. -Constructing new electric networks in addition to the old grid. 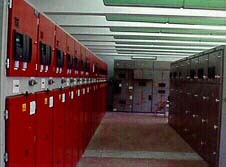 -Minimizing the network technical loss and the fines resulting from lower power factor values. -Building new distribution transformer substations to serve metropolitan areas . -Stepping the voltage up from 6.6KV to11 kV . -The rehabilitation of the main distribution substations in Beit Sahor. The PEA prepared studies and plans to improve the electrical sector .Therefore ,the PEA established a department for rural electrification to complete and integrate the national plans .The main goal of this department is to improve the living conditions for the people living in the rural areas by connecting these areas to the main grid and thus enabling a stable and affordable electricity supply rather than the unreliable and expensive local generators .The PEA submitted these plans to the donor countries especially Belgium and Czech . The aim of this project is to help PEA to prepare a strategic action plan for energy sector through he suggested legislation and by studying the possibility of using Renewable Energy Resources (RES) in addition to data collection .The duration of the project will be 12 months . The budget amounts to 150,000 ECU. The project lasting for 12 months has evolved with establishing a solar water heater -testing laboratory .The palestinian energy scientific center was also founded . The PEA and the EC funded the project . 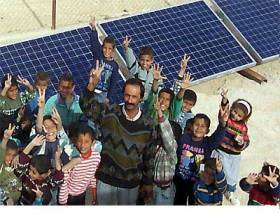 In Mid December 1998 ,a solar energy was installed in Arab AI -Kaabneh village ,20 km to the south of Hebron . This unit was donated to PEA by green star foundation with the assistance of the US department energy .The suntainer has maximum power of 4Kw and can generate up to 20 K wh of AC electricity per day .The suntainer include asolar powered ultraviolet water purifier ,a vaccine cooler and a digital cellular antenna for access to data network .The total cost of the project was 150,000 USD . An agreement was signed between the PEA and the palestinian Specifications Institution to establish a lab to test the flat plate solar collectors locally manufactured in the Gaza Governorates in order to meet the international criteria for such industry ,Another lab is to be established in the North Governorates . The project is under execution where the lab will be situated in the PEA Head Quarters and will be ready soon to receive the solar collectors for validity approval . *Supporting efficiency improvement and loss reduction in the distribution of electric power . *Facilitating adoption and implementation of energy conservation measures in residential commercial and industrial sectors through education promotion financing and standard -setting activities. *Assisting in the international and regional transfer of experience and technology that could be instrumental in the GHG emission reduction . *promoting public and private sector investment in energy projects that are beneficial for the global environment . PEA has recently established two new departments ,energy department and nuclear energy and radiation protection directorate (NERP) The energy department is responsible for the overall planning ,regulation , and control .Mean while the NERP responsible for policy making ,legislation promotion the peaceful application of ionizing a radiation and responsible also for establishing a Palestinian radiation protection and safety program . · A strategic energy action for Palestine . · Information system project . · Studying of rational use of energy in the Building of Al-Bireh municipality project . · Studying of rational use of energy in Gaza strip for domestic sector . · Performing a comprehensive scan through the ionizing radiation sources and practices in palestine were identified and analyzed . · A five years action plan for NERP was prepared . · Organizing training sessions and workshops pertaining radiation protection and radio action waste management . · Establishing Palestinian radiation protection program and analyzing the natural background of radioactivity in Palestine . In the framework of energy sector policy described in the letter of Sector Policy signed in June 1997, the Palestinian Energy Authority (PEA) is developing a medium-term strategy which aims in particular at "focusing on rehabilitating existing network and services and extend services to currently unserved communities" In this context, the PEA looks forward to connect the remaining isolated (partially electrified and non electrified villages in the Jenin and A1Kafriyat areas to the Medium Voltage Network. This project could financed by the Agency Franchise de Development (AFD),which expressed its deep interest for it . The PEA carried out a feasibility study to check the technical, environmental and economic feasibility of this project this feasibility study has been performed in Compliance with the AFD requirement. The project will consist in the connection to the Medium Voltage Network and the rehabilitation of the low Voltage Network of 20 villages of the Jenin area, and 9 villages of the A1 Kafriyat area. None of these villages is currently connected to the main network 16 out 20are equipped with generators and low voltage network in the Jenin area, and 8 out of 9 in the A1 Kafriyat area. The following tables presents the list of the villages concerned by the proposal. This program included several projects of puplic and private utilities in the sectors as a whole to serve and promoting the society. 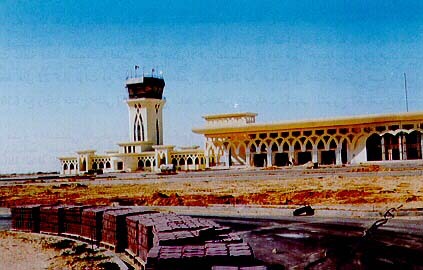 PEA has planned and performed the installation project of electricity to Gaza international airport in 1996. 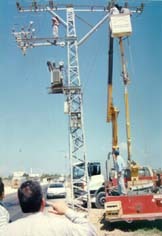 This project has been performed in 2 phases: The first is to tranform and move the main electric line feeder to Rafah area which was the main obstacle that inhibits establishing runway (tarmac), Also aground Substation was established .This project supplied people (agroup of people ) and agriculture zones by electrieity . PEA has signed agreement with palestinian Givil aviation included 2 Contract to feed the airport utility by electricity 22high volt K.V This stage is to install underground network cables 4 K.M long with metering room and circuiter and data analysis unit . PEA has errected underground Cable -high voltage line to Palestine Square instead of old overhead network ,and low voltage network to serve the square itself and the areas around and that created a Civilized view in Gaza . PEA Carrid out to perform rehabilitation distribution networks in west bank according to ( Kenedy & Donken ) ,the consultant Company . This project will develop and upgrade electric system and supply electricity to new areas and to Connect partnes to all sectors of Housing , Industrial, Tourism, which funded by Norweigan goverment at sum 27 million $. PEA also tries to excute 25 villages in Nablus governorates financied by Belgium goverment at Cost 8 million $. In the other hand in the Southern governorates, world bank has financied upgrading of electric distribution and to develop the structare of power sector in the Southern governorates in west bank . PEA started performing to electrify and the Contryard funded by Tcheick government and the first phase has been performed . Comp and water substations 15 k.m mid-voltage lines has been installed 33 k.v , and 17 transformers . This stage served about 22 thousand , of people and a part of Tubas . These areas have been supplied by electricity . It is worth mentinoing that the second stage a bout 900 thousand dollars. Which included 9 villages to be funded by UNDPwhile the third and the third and the fourth phase are still under discussion. Since its foundation PEA focused on Setting an comprehensive action plan to identify its main target which represents in Capacity building on the management basis and re-planing and organizing power Services sector and to support branch projects to develop the Services of electricity and to promote the national economic and the improvement of Social conditions included sectors of Housing, Education, Health, Infrastructure and government and public utilities . PEA had Coordinated with PECDAR to develop Salah Edin street by upgrading the network, preparing plans and study inorder to perform the main street . Overhead network had been approved in the wide areas and underground Cables in the normal areas with regard to high voltage and overhead cables system for low voltage network . 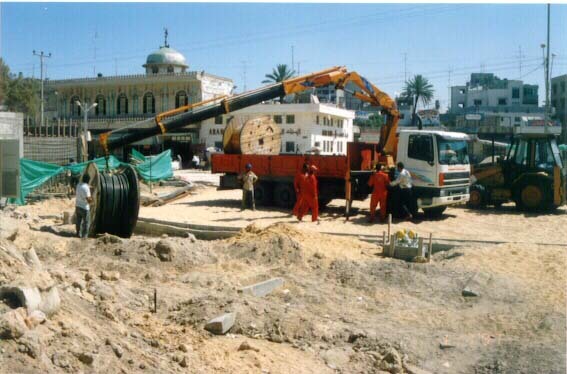 A project is about installation underground Cable - which Considers as the first project which was performed in Gaza . It’s 2.5 k.m length on three phases . That provides secure and safety and the improvement of the network performance and it is effeciency and reduce the technical looses . PEA Supplied the military hospital by electricity which Consider the only one in the area that serves thousands of citizens and militrians . Aproject which was funded and performed by PEA . This is about installation low voltage network with 200m long . * Establishing an electric line high voltage to Khanynis city . * Elmaghazi alternative line project with 5.5 km length . * Electrification Almughraga project . * Installing a generator to Tubas village . Govermental and non govermental utilities . Private utilities and Sectors . Participating with national and technical Committies .